With its buzzing atmosphere and ramshackle décor, the Vaults Festival is brilliant example of how fringe theatre can invade the most unlikely of spaces. And within the Festival are little gems of shows, such as Eggs. 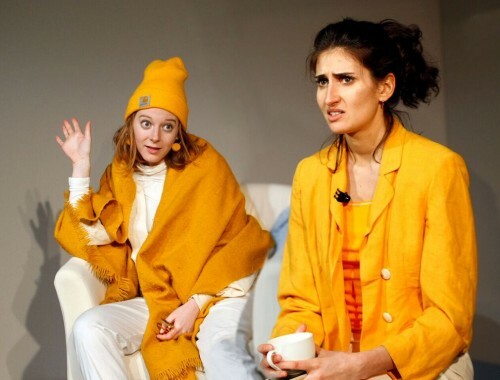 Following two mid-twenty year old friends over a year or so, Eggs explore the nature of female friendship through the post-uni wasteland, finding partners and proving yourself in the workplace, all to a banging 90s soundtrack. Florence Keith-Roach’s writing is sharp, spikey and completely believable. It’s faintly reminiscent of Lena Durnham’s early work (but thankfully is much funnier and less self-indulgent whining) and it doesn’t shy away from the occasional shock. Her writing brings out the natural speech patterns of two twenty-something women in London, complete with shut downs, interjections and laughs. Her characters are fully formed, both not entirely likable but instantly relatable. Also taking on the role of Girl 1, Florence Keith-Roach brings a quirky twist to the character, a slightly privileged performance artist who feels both empowered and lost as she tries to work it all out. She could have easily stepped into Phoebe Buffay territory but the spitefulness in her voice when delivering insults is cutting and raw. As Girl 2, Amani Zardoe has a trickier job getting the audience to warm to her as the character slowly develops into a slight control freak and therefore draws less sympathy. Does that make her performance any less engaging to watch? Does it heck! Zardoe fires out shocking one liners with barbed accuracy, visibly bubbles with frustration at her friend and holds her ground on stage. Together these actresses are brilliant at bringing out the comfort of long-term friendship without slouching into boredom. One aspect I particularly enjoyed was Lily Ashley’s cheeky costume design; it took me until the latter half of the show to twig that dressing the actresses in solely yellow and white was a nod to the play’s title and as soon as the penny dropped I couldn’t stop smiling. Eggs is without a doubt the start of something interesting for this company. Its snappy writing and interesting subject matter is something that be developed further and I hope this isn’t the last we’ve seen of these ladies.